The RKP is a limited-issue power supply intended to provide the high current demands of Metasonix R and RK series Eurorack modules. It is an 8HP module that accepts DC power from two +12v switchmode power adapters of the “universal” type, provides protection against reverse voltage and overcurrent (5 amps maximum), and has six (6) standard 16-pin Euro power output headers on the rear. 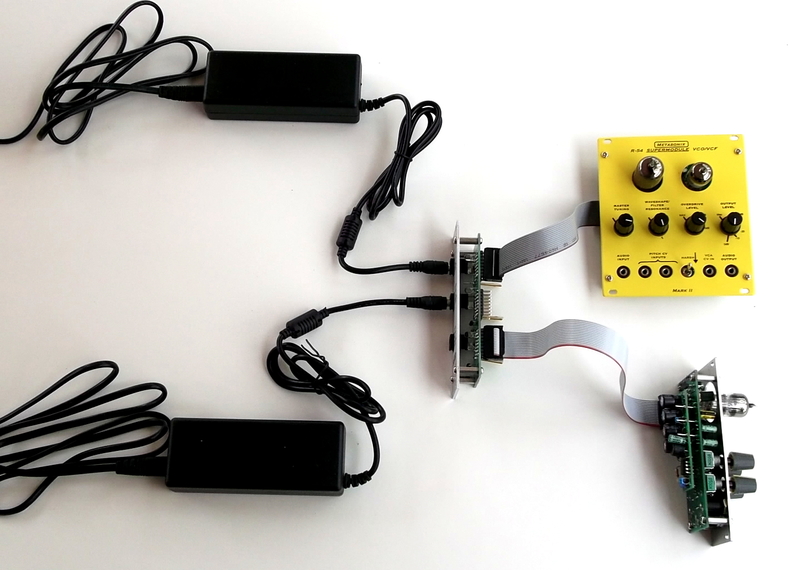 The RKP, used with the 5-amp adapters provided, will run any combination of six Metasonix R or RK modules. The RKP uses high-current adapters because the vacuum tubes in Metasonix modules have filamentary heaters to heat their cathodes to operating temperature (about 650 degrees Celsius). Similar to tungsten-filament lamps, the heaters in tubes have a lower electrical resistance when cold than they do at operating temperature. The power supply must be able to supply this larger “cold inrush” current in order to bring the heater to operating temperature. Usually it requires about 2.0 to 2.5 times the normal operating current, for only a few seconds, to heat the tube properly. This was not a problem in the “old days”, when tubes in electronics ran their heaters from power transformers or directly from the AC “mains”. Inrush currents weren't a problem, because there was extra capacity available. Conventional iron-core power transformers can handle brief inrush current easily. But the modern switchmode power supply has a problem with this. Because it is designed to supply a maximum rated output current at all times, and has NO inrush capacity above that. So running tube heaters from a switchmode supply demands that the supply be “over-rated” by at least twice the normal operating current, just to handle a few seconds of the cold current at power-up. Yes, it's wasteful, but if the user wants the “magic” of vacuum-tube audio, this is the only way. For this reason, switchmode power supplies are almost never seen in modern tube guitar amps – they continue to use heavy, costly power transformers, that are ironically even more wasteful. If modules needing 5-volt power are to be connected to the RKP, it has an additional input jack to accept an optional 5-volt AC adapter output. As with the 12-volt inputs, it will accept up to 5 amps. Size: 8HP wide, depth behind panel 1.5" (38mm). Power requirements: includes two AC adapters that accept 90-250 VAC mains power input, a power cable for North American use is included (use in most other countries will require a plug adapter). The RKP is protected against reverse supply voltage, overvoltage, or incorrect hookup to external equipment. As with all our products, the RKP is made in small quantities and totally handcrafted in the USA.